Not to be confused with the computer graphics business Genigraphics. The Genographic Project, launched on April 13, 2005 by the National Geographic Society, is an ongoing genetic anthropological study that aims to map historical human migration patterns by collecting and analyzing DNA samples. The current phase of the project is Geno 2.0 Next Generation. As of 2018, almost one-million participants in over 140 countries have joined the project. Created and led by project director Spencer Wells in 2005, The Genographic Project is a privately funded, not-for-profit collaboration between the National Geographic Society and the Waitt Foundation. Field researchers at eleven regional centers around the world first began by collecting DNA samples from indigenous populations. Since the fall of 2015, the Project has been led by Miguel Vilar. In fall 2012, the Genographic Project announced the completion of a new genotyping array, dedicated to genetic anthropology, called GenoChip. GenoChip is specifically designed for anthropological testing and includes SNPs from autosomal DNA, X-chromosome DNA, Y-chromosome DNA and mitochondrial DNA (mtDNA). The design of the new chip was a collaborative effort between Wells of National Geographic, Eran Elhaik of Johns Hopkins, Family Tree DNA, and Illumina. In the fall of 2015, a new chip was designed as a joint effort between Vilar, current Genographic Lead Scientist, and Family Tree DNA. The Admixture test developed by Wells and Elhaik classifies individuals by assessing their proportions of genomic ancestry related to nine ancestral regions: Northeast Asian, Mediterranean, Southern African, Southwest Asian, Oceanian, Southeast Asian, Northern European, Sub-Saharan African, and Native American. In 2016, the project began utilizing cutting-edge Helix DNA sequencing for Geno 2.0 Next Generation, the current phase of the Genographic Project. As compared to earlier phases which used nine regional affiliations, Geno 2.0 Next Generation analyzes modern-day indigenous populations around the world using either 18 or 22 regional affiliations. Utilizing a DNA-collection kit, Helix acquires a saliva sample from a participant, which is then analyzed for genomic identifiers that offer unprecedented insight into the person’s genetic origins. The data is then uploaded to the Genographic Project DNA database. Since 2005 Genographic has used volunteers (in fieldwork and providing DNA samples) and citizen science projects. The National Geographic Society now also sells non-profit self-testing kits to members of the general public who wish to participate in the project as “citizen scientists”. Such outreach for public participation in research has been encouraged by organizations such as International Society of Genetic Genealogy (ISOGG), which is seeking to promote benefits from scientific research. This includes supporting, organization and dissemination of personal DNA (genetic) testing. The ISOGG supports citizen participation in genetic research, and believes such volunteers have provided valuable information and research to the professional scientific community. Since 2005, the Genographic Project has used the latest genetic technology to expand our knowledge of the human story, and its pioneering use of DNA testing to engage and involve the public in the research effort has helped to create a new breed of "citizen scientist." Geno 2.0 expands the scope for citizen science, harnessing the power of the crowd to discover new details of human population history. Shortly after the announcement of the project in April 2005, the Indigenous Peoples Council on Biocolonialism (IPCB), based in Nevada, released a statement criticizing the project: spokespersons noted its connections to controversial issues (such as concern among some tribes that the results of genetic human migration studies might indicate that Native Americans are not indigenous to North America) raised by the Human Genome Diversity Project, which had government overview, unlike the privately-funded Genographic Project. The IPCB recommended against indigenous people participating. It also recommended that indigenous peoples boycott IBM, Gateway Computers, and National Geographic, which at that time were collaborating on the Genographic Project. "The Genographic Project is exploitative and unethical because it will use Indigenous peoples as subjects of scientific curiosity in research that provides no benefit to Indigenous peoples, yet subjects them to significant risks. Researchers will take blood or other bodily tissue samples for their own use in order to further their own speculative theories of human history". UNPFII conducted investigations into the objectives of the Genographic Project, and concluded that, since the project was "conceived and has been initiated without appropriate consultation with or regard for the risks to its subjects, the Indigenous peoples, the Council for Responsible Genetics concludes that the Indigenous peoples' representatives are correct and that the Project should be immediately suspended". Around May 2006, the UNPFII recommended that National Geographic and other sponsors suspend the project. Concerns were that the knowledge gleaned from the research could clash with long-held beliefs of indigenous peoples and threaten their cultures. There were also concerns that indigenous claims to land rights and other resources could be threatened. As of December 2006[update], some federally recognized tribes in the United States have declined to take part in the study. "What the scientists are trying to prove is that we're the same as the Pilgrims except we came over several thousand years before", said Maurice Foxx, chairman of the Massachusetts Commission on Indian Affairs and a member of the Mashpee Wampanoag. "Why should we give them that openly?" Not all peoples agree with his position; as of December 2012[update], more than 70,000 indigenous participants from the Americas, Africa, Asia, Europe, and Oceania had joined the project. ^ a b c d e f Geno 2.0 Next Generation National Geographic. June 28, 2018. Retrieved June 28, 2018. ^ Genographic Volunteer Participants National Geographic. January 8, 2018. Retrieved June 28, 2018. ^ The GenoChip: A New Tool for Genetic Anthropology Oxford Journals. May 9, 2013. Retrieved June 28, 2018. ^ Helix DNA Sequencing and Geno 2.0 Helix. January 26, 2018. Retrieved June 28, 2018. ^ a b Next Generation Reference Populations National Geographic. February 23, 2018. Retrieved June 28, 2018. ^ Bonney, R. and LaBranche, M. (2004). "Citizen Science: Involving the Public in Research," ASTC Dimensions, May/June 2004, p. 13. ^ Baretto, C., Fastovsky, D. and Sheehan, P. (2003). "A Model for Integrating the Public into Scientific Research," Journal of Geoscience Education, 50 (1). pp. 71–75. ^ McCaffrey, R.E. (2005). "Using Citizen Science in Urban Bird Studies," Urban Habitats, 3 (1). pp. 70–86. ^ King, Turi E.; Jobling, Mark A. (2009). "What's in a name? Y chromosomes, surnames and the genetic genealogy revolution". Trends in Genetics. 25 (8): 351–60. doi:10.1016/j.tig.2009.06.003. PMID 19665817. The International Society of Genetic Genealogy (www.isogg.org) advocates the use of genetics as a tool for genealogical research, and provides a support network for genetic genealogists. It hosts the ISOGG Y-haplogroup tree, which has the virtue of being regularly updated. ^ Mendex, etc. al., Fernando (28 February 2013). 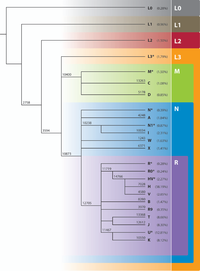 "An African American Paternal Lineage Adds an Extremely Ancient Root to the Human Y Chromosome Phylogenetic Tree". The American Society of Human Genetics. pp. 454–459. Retrieved 10 July 2013. ^ Wells, Spencer (2013). "The Genographic Project and the Rise of Citizen Science". Southern California Genealogical Society (SCGS). Archived from the original on 10 July 2013. Retrieved July 10, 2013. ^ Harry, Debra and Le'a Malia Kanehe. "Genetic Research: Collecting Blood to Preserve Culture?" Cultural Survival, 29.4 (Winter 2005). Accessed 4 February 2014. ^ a b Harmon, Amy (10 December 2006). "DNA Gatherers Hit Snag: Tribes Don't Trust Them". The New York Times. ^ "United Nations Recommends Halt to Genographic Project". ipcb. "Finding the roots of modern humans". CNN. 14 April 2005. "'Genographic Project' aims to tell us where we came from". USA Today. 17 April 2005. "Crusaders left genetic legacy". BBC News. 27 March 2008. "Human Line 'Nearly split In Two'". BBC News. 24 April 2008. Spencer Wells: Building a family tree for all humanity on YouTube, on TED, 29 August 2008.